How Do Sub Channels Work? 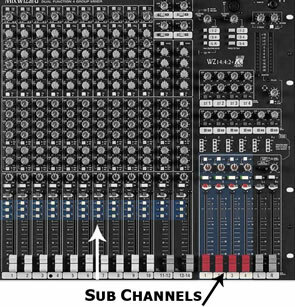 Sub channels are provided on higher model soundboards and the use of these sub channels are to help divide and segregate different instrument types. This helps bring ease to the sound operator(s) and to help for fast control of unwanted levels. Make sure you have a good understanding of the channels and the best layout for your soundboard in regards to these channels. Where Are Sub Channels Located? The sub channel selection buttons are located usually right beside each channel volume slider. These will be numbered and it is important to know and remember which subs are designated for which common instruments. Sub channel masters are typically located near the master output controls. There are normally four different sub channels to use. It is important to make sure that the ‘output to master’ button is enabled for the sub channels you would liked mixed. On each stereo soundboard there are rotary knobs called ‘pans’. These pans are used for panning the channel’s signal to the left, to the right or balanced. These knobs are generally right above the channel volume slider. Now let’s say that you have five drum microphones and for each drum microphone there is a channel corresponding to that microphone. Now we would like to ‘group’ these common sounding signals into one group, or sub channel. Right along the channel volume sliders there will be a few, small buttons. The buttons that are on, will indicate that specific channel’s sub channel or master direction. For most soundboards, there are four sub channels. If this is the case, there will be three buttons along the sliders. One button is for sending the signal directly to the master output. Generally labeled, “L-R”, if you want a signal to bypass the sub channels, make sure this button is on. The other two buttons will be called, “1-2” and “3-4”. The creators of soundboards made this part very easy to remember and function; by using the pan knob, point the knob towards the side of the number channel you want. With that in mind; back to the drums. We want the drums to be subbed into sub channel four. To do this, we press the sub group button labeled “3-4” and rotate the pan knob all the way to the left (towards the 4). Now in doing this, we have told that channel to first go through the sub channel four. Do this with all the five drum microphones you have connected to the mixer. The controlled volume of all the drums is now in one convenient slider. Using sub channels throughout your mix at church will not only improve the sound, but help ease changing audio levels during a service or show. Try to look over and locate that your desired channels are being subbed correctly and that the sub channel masters are outputting to the master output. This way of mixing can seam complex at times, depending on the experience of the sound tech. Any one mixing audio in a live setting, like in church, should know this method and many others.